To think of only one woman who inspires me the most is a difficult task as there are so many wonderful and influential heroines to mention for example Rosa Parkes, Josephine Baker, Beatrix Potter, Dolly Parton, Virginia Woolf, Ella Fitzgerald and Audrey Tautou…an eclectic and extensive list that could go on! However I have decided to write about someone who is little known to most, but certainly a great heroine of mine: a Swiss artist called Emma Kunz. Picture 1: Emma Kunz sketch, coloured pencil on paper. It was a dank and dreary day at Uni last year when in a dark corner of the library I came across a book entitled 3 X Abstraction, a modest looking hard back, a little dog eared but smelling wonderfully of old musty paper! 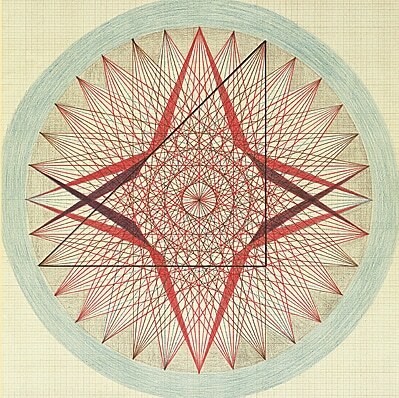 I stared in awe at the intricate spirograph-like drawings of Kunz and felt that heart crushing sense of wholeness one feels after coming across a kindred spirit. Picture 2: Emma Kunz sketch, coloured pencil on paper. Emma kunz was an artist and healer who lived in Switzerland from 1892-1963. She was a recognized researcher and used her artwork to heal sick patients. From a young age she believed in the power of telepathy and prophecy and practiced using a pendulum which became the basis for her artwork. Present in her drawings is an intense energy and sense of movement which was dictated by the swing of the pendulum illustrating various energy fields that Kunz believed she could see. She did not believe in miracles however, only abilities that lie dormant in us all. In 1941 she discovered in nearby caves a healing rock called AION A which she used to help her friend Aton C.Meier when he became seriously ill with infantile paralysis. AION A comes from Greek aion meaning without limitations and the substance heals not only through its mineral composition but its bio dynamic energy. It is used by many doctors today in Switzerland and Kunz believed it to have not only physical healing powers but the ability to heal a spirit. From 1938 Kunz began making large scale drawings on graph paper which are not only beautiful but encode a vast amount of knowledge. She would complete a drawing in a day staying up all night to finish if she had to. She describes them as follows ‘Shape and form expressed as measurement, rhythm, symbol and transformation of figure and principal’. This is certainly apparent in the resulting images where angles and lines swirl together forming a colourful and energetic mass.